This article is about the DC Comics villain. For the other DC Comics characters, see Brainiac 2, Brainiac 5, and Brainiac 8. For other things called "brainiac", see Brainiac (disambiguation). Brainiac is a fictional supervillain appearing in American comic books published by DC Comics, usually as an adversary of Superman, his second deadliest archenemy after Lex Luthor, and a frequent enemy of the Justice League. (October 2009). Art by Francis Manapul. Brainiac is typically depicted as an extraterrestrial cyborg or android. He is one of Superman's primary enemies, and is responsible for shrinking and stealing Kandor, the capital city of Superman's home planet Krypton. In some continuities, he is also responsible for Krypton's destruction. Due to multiple revisions of DC's continuity, several variations of Brainiac have appeared. Most incarnations of Brainiac depict him as a green-skinned being in humanoid form. He is bald, with a set of linked electrode-like objects (sometimes glowing) protruding from his skull. His name is a portmanteau of the words brain and maniac. In 2009, Brainiac was ranked as IGN's 17th Greatest Comic Book Villain of All Time. Brainiac first appeared in Action Comics #242 (July 1958), and was created by Otto Binder and Al Plastino. First appearing in Action Comics #242 (July 1958), Brainiac is a bald, green-skinned humanoid who arrived on Earth and shrank various cities, including Metropolis, storing them in bottles with the intent of using them to restore the then-unnamed planet he ruled. He is originally notable only for his having shrunk the bottle city of Kandor, for having a shrinking ray, and for using a force field. In subsequent appearances in this early period, Brainiac is used mostly as a plot device rather than as a featured villain of the month. Brainiac's next appearance is mostly behind the scenes, when he tries to kill Lois Lane and Lana Lang, prompting Superman to give Lois and Lana superpowers. But the villain remains unseen except as a plot twist at the end of the story. Brainiac's next appearance in "Superman's Return to Krypton" in Superman #141 (November 1960) displays how the villain stole the bottle city of Kandor, which is ironically and tragically the only city on Krypton that believes Jor-El's warning of doom for the planet, and had already built a space ark within the city to save the population. Brainiac's next present-day appearance is in Action Comics #275 (April 1961), which shows the villain planning to defeat Superman by exposing him to both red and green kryptonite, giving Superman a third eye on the back of his head, forcing him to wear various hats to hide it. Superman soon defeats Brainiac and sends him off into the distant past. 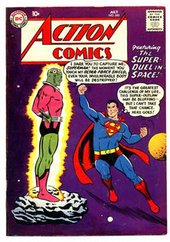 This is the first in-story appearance of Brainiac's iconic red diode/electrode-like objects atop his head, which had previously appeared on the cover of his first appearance in Action Comics #242 (July 1958), but were not shown in the actual story. In "Superboy" #106 (July 1963), Superman as a baby meets Brainiac and it is explained that Brainiac looks the same as he has a 200-year life span. It is revealed that he came from a planet called Bryak and after a voyage in space, he returns to find everybody dead from a plague. He intends to get people from other planets (in shrunken cities, and he has a growth ray) to repopulate Bryak, where he will rule them. Brainiac's legacy was revealed in Action Comics #276 (May 1961), in a Legion of Super-Heroes back-up story. This story introduced a green-skinned, blond-haired teenager named Querl Dox, or Brainiac 5, who claimed to be Brainiac's 30th century descendant. Unlike his ancestor, Brainiac 5 used his "twelfth-level intellect" for the forces of good and joined the Legion alongside Supergirl, with whom he fell in love. His home planet was given variously as Bryak, Yod or Colu. In Superman #167 (February 1964), it was retconned that Brainiac was a machine created by the Computer Tyrants of Colu as a spy for them to invade other worlds, for which he was given a non-computer appearance. Brainiac's distinctive gridwork of red diodes across his head are also explained. He was created with visible "electric terminals of his sensory 'nerves'" that he cannot function without. Luthor discovers that the Computers could have given him a twelfth-level intellect, but gave him a tenth-level, the same as them, so he would not try to dominate them. Luthor frees Brainiac from a prison on another world and increases his intelligence; however, he implants a timer that will make Brainiac black out so the computer does not betray him, as only Luthor can reset the timer and if Brainiac tries to tamper with it, one touch will cause an explosion. However, Brainiac tricks Luthor by making a device that hypnotizes Luthor, who removes the timer and forgets Brainiac is a computer. Explaining the 1961 introduction of Brainiac's descendant Brainiac 5, his biological disguise included an adopted "son", a young Coluan boy who was given the name "Brainiac 2". 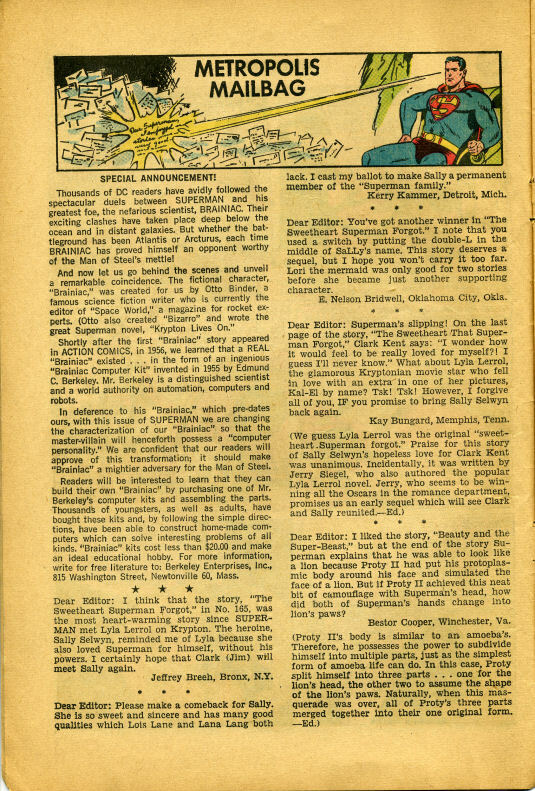 In the same issue, the letter column contained a "special announcement" explaining that the change in the characterization of Brainiac was being made "in deference" to the "Brainiac Computer Kit", a toy computer created by Edmund Berkeley and based on the Geniac that predated the creation of the comic book character. The boy, whose name was Vril Dox, went on to lead a revolt against the Computer Tyrants, eventually destroying them. Brainiac sees a monument to this when he returns to Colu. At some indeterminate point in time, Brainiac fled into the 30th century. Developing the ability to absorb and manipulate massive amounts of stellar energy, he remade himself as "Pulsar Stargrave". He became a powerful enemy of the Legion of Super-Heroes, and once masqueraded as Brainiac 5's biological father. In current continuity, Brainiac's connection to Pulsar Stargrave remains an open question, one even Brainiac 5 has yet to resolve. In the 1980s, DC Comics attempted to re-define several aspects of its Superman series in order to boost sagging sales. At the same time as Lex Luthor acquired his green-and-purple Lexorian battlesuit, Brainiac was re-envisioned (under the auspices of writer Marv Wolfman and artist Gil Kane). In Action Comics #544 (June 1983), Brainiac had constructed a giant, artificial, computer-controlled planet and used it in his latest attempt to destroy Superman. His defeat at the hands of the Man of Steel left him trapped at the center of the planet, unable to escape. He was forced to make a nearby star, Epsilon 4, explode in a nova in order to destroy the machine-world. It, however, also dissolved Brainiac's humanoid body into a stream of sentient molecules that, after a fantastic voyage through time and space, returned to the present and regestated as a living computer with no trace of human emotions and a mind stooped in logic. His new body (designed by Ed Hannigan) had the appearance of a skeleton of living metal with a grey (sometimes iridescent), honeycomb-patterned "braincase." He also created a starship to house his new body which was actually an extension of himself; the ship was shaped like his own skull, with metal tentacles dangling from it that he could manipulate at will. Brainiac retained this appearance until after the Crisis on Infinite Earths miniseries. The Silver/Bronze Age Brainiac met his end in the "Whatever Happened to the Man of Tomorrow?" story line that closed out the Pre-Crisis Superman chronology. Lex Luthor found Brainiac's robotic head and was fused with it, making him immortal to everything. Brainiac took control of Luthor's body and sought to destroy Superman once and for all, teaming up with the Legion of Super-Villains. Fighting Brainiac's control, Luthor begged a superpowered Lana Lang to kill him; she complied by breaking his neck. Though Luthor died, Brainiac was able to retain control of the body for a little while before rigor mortis set in and his brain was forced to leave it. "Propelled by sheer malice", the skull crawled a few inches before finally running down. In the Post-Crisis DC Universe, Brainiac's history was completely rewritten. 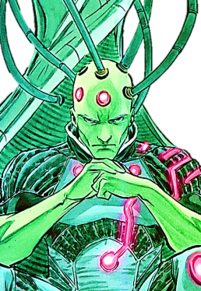 The Post-Crisis version of Brainiac was now a radical Coluan scientist called Vril Dox who, having attempted to overthrow the Computer Tyrants of Colu, was sentenced to death. In his last moments before disintegration, his consciousness was attracted light years away to Milton Moses Fine, a human sideshow mentalist who worked under the alias "The Amazing Brainiac". Needing cranial fluid to maintain his possession of Fine, Dox went on a murder spree. He discovered that Fine had genuine psychic powers and was thus a metahuman, which he frequently wielded against Superman. In the early 1990s, Brainiac returned in the "Panic in the Sky" storyline. He seized control of Warworld and manipulated Maxima into assisting him. Then he brainwashed Supergirl and the alien warrior Draaga before capturing Metron and setting off for Earth. Orion and Lightray of New Genesis attacked Warworld, but they were quickly taken down by Maxima and Supergirl. Brainiac sent the mental image of the New Gods captured to Superman in order to taunt him, and he also sent his "headship" (a green-hued variant of the Pre-Crisis skull-like ship) to Earth in a punitive expedition. These acts prompted Superman to go on the offense, rather than wait for the inevitable invasion. He gathered a coalition of most of the world's superheroes and launched a preemptive strike at Warworld before it could arrive on Earth. A small, elite force was left behind for any scouting forces that would be sent ahead. Superman led the attack on Warworld, where Supergirl and Draaga managed to shrug off their brainwashing and rally to Superman (although Draaga was killed in the fighting). Brainiac briefly took control of some of Earth's heroes, but it was not enough to turn the tide. Maxima would shortly switch sides in the fighting too, perceiving Brainiac as the true villain at last. Flash, Maxima, and the Metal Men attacked him in his lair, where Maxima managed to lobotomize him (but was stopped short of killing him). His vegetative body was taken back to New Genesis for observation. Brainiac would next emerge about a year after the death and return of Superman. After a dead body appeared in Superman's tomb, prompting the world to wonder if the Superman who was flying around was the original or a fake, Superman began to track down all of his foes who might be capable of such a hoax. 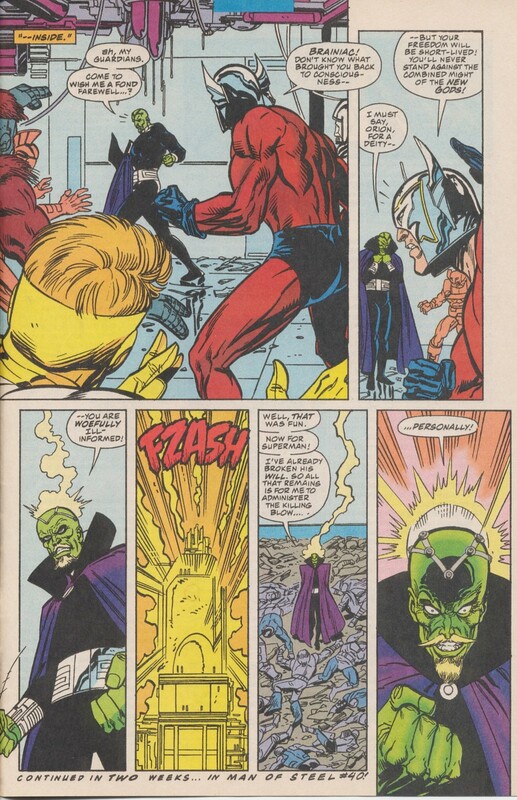 While Brainiac was initially eliminated as a suspect, he soon turned out to be the true culprit, creating the illusion even in his comatose state on New Genesis. He managed to revive himself there and returned to Earth in secret. While hidden, he created even more delusions, causing Superman to question his very sanity before realizing who was really at fault. Superman and Brainiac squared off in Metropolis, where Superman taunted the evil villain, claiming that at heart he was really just Milton Moses Fine, a cheap entertainer. This caused some break in Brainiac's mind where Fine's personality reasserted himself, burying Brainiac's. Fine was then escorted off to a psychiatric facility. During a later skirmish with Superman in Metropolis, Milton Moses Fine's body was irreparably damaged, leaving Brainiac with only a short time to live. In order to preserve his life, he concocted an elaborate scheme by having an agent of his, a Coluan named Prin Vnok, use a time machine to travel to the End of Time itself and retrieve Doomsday, who had been left there by Superman and Waverider to ensure that he would never be a threat again, and use Doomsday as a new host body. Seconds before the forces of entropy destroyed him forever, Doomsday was taken to safety by Vnok and returned to Colu. There, a terminally-wounded Brainiac transferred his consciousness into Doomsday's body, temporarily becoming the most powerful being in the universe; a genius psychic mind inside an unstoppable, indestructible titan. However, Doomsday's own raging mind would eventually overwhelm Brainiac's will, and he reacted too quickly for Brainiac and Vnok to erase his mind using chemical or psionic treatments, forcing Brainiac to find another body. While still lodged in Doomsday's head, Brainiac decided to acquire a sample of human DNA that he could modify with Doomsday's DNA to create a new version of Doomsday that did not possess the creature's mind. Brainiac chose to use Pete Ross and Lana Lang's newborn baby, born eight weeks premature-and at that moment being transported by Superman to the best Neo-Natal Intensive Care Unit in the country-as the template for his new body. He intercepted Superman during the trip to the hospital and stole the baby to hurt his long-time foe, correctly deducing that it was the child of someone close to Superman. Superman thwarted Brainiac's plot by driving him out of Doomsday's body with the use of a telepathy-blocking 'psi-blocker' that he had used in his last battle, forcing Brainiac out of Doomsday and leaving him with no other option but to adopt a recently designed robotic body, dubbed Brainiac 2.5, where he himself believed would be forever trapped, as he could not abandon it. At the turn of the millennium, Brainiac 2.5 revealed that he had placed a sleeper virus in LexCorp's Y2K bug safeguards. This virus was intended to dramatically boost his abilities. However, the virus instead allowed his upgraded future self, Brainiac 13 (or "B-13"), to travel from the 64th century to the present day and take control of Brainiac 2.5's body. Brainiac 13 then began transforming Metropolis into the 64th century version of the city, which he controlled, and also began upgrading Metallo into a giant-sized version of himself. Brainiac 13 then took control of several android superheroes, such as the Red Tornado and Hourman, and used them against Superman. The Metal Men's responsometers were able to protect them from his programming, and allowed them to help defeat Metallo. During a fight with the Eradicator (who was attempting to 'hijack' the B13 virus and use it for its own ends), Superman discovered that Brainiac 13 could not cope with Kryptonian technology, due to incompatibility issues. This gave Superman a plan to stop Brainiac 13's scheme. With the aid of the rebuilt Kelex, Superman tricked Luthor into connecting a Kryptonian battlesuit to one of Brainiac 13's power conduits. Kelex then reactivated the Red Tornado to help Superman break Brainiac 13 down into his respective nanobots and trap him in the suit. Brainiac 13 was able to work with Brainiac 2.5—now transferred into the aged body of Lena Luthor—and prepared a tactic against Imperiex for the upcoming Imperiex War. The Brainiacs successfully engineered Imperiex's defeat, allowing Brainiac 13 to absorb Imperiex's power and use it to overpower the combined heroes and villains of the universe while simultaneously devastating both Earth and Apokolips. Brainiac 13 planned to use the power he stole from Imperiex to conquer the universe and reshape it in his image, and is made so powerful by the absorption that none of the heroes, not even Superman, can hope to damage him. However, with help from Lex's temporal displacement technology and Darkseid's Boom Tube technology boosted by magic supplied by Tempest and the Amazons, Superman was able to destroy Brainiac 13 and Imperiex by sending them through a temporal Boom tube where they were annihilated in the Big Bang. Brainiac 13 had his body disintegrated and the remnants of his mind scattered across sixty trillion light years, finally killing the chronologically last known version of Brainiac. After the death of Brainiac 13, Superman discovered that the version of Krypton he previously visited via the Phantom Zone was in fact a trap created by Brainiac 13. Having been defeated by Kryptonian technology, Brainiac 13 had traveled back in time to the real Krypton prior to its destruction. There, he stole the Eradicator matrix and Jor-El's diaries, and created a false Krypton based on Jor-El's favorite period in history. Sometime later, Superman traveled into the future and battled Brainiac 12. He learned that everything Brainiac 13 did in the past was designed to ensure things reached the point where Brainiac 13 would be created. Brainiac 12's defeat before his upgrade apparently reversed the advances Brainiac 13 had made to Metropolis. Around the time of the Graduation Day event, a future version of Brainiac, called Brainiac 6, used his "granddaughter", Brainiac 8 (also known as Indigo), to kill Donna Troy in order to ensure the fate of Colu. Indigo then infiltrated the Outsiders until she attacked the team, along with Brainiac 6 and his allies, Lex Luthor, and a brainwashed Superboy, who had attacked the Teen Titans. In the ensuing battle, Indigo died and Superboy broke away from the brainwashing, while Luthor escaped. While his ship was destroyed, Brainiac's condition and whereabouts after the battle are unknown. Later stories revealed that elements of Brainiac's Pre-Crisis history occurred in the Post-Crisis character's history prior to his possession of Milton Moses Fine and his first encounter with Superman. The citizens of Kandor recall that Brainiac stole their city from Krypton, and not the alien wizard Tolos. History of the DC Universe mentions his defeat by the Omega Men, although this is not seen in Crisis on Infinite Earths itself, and noted a second Brainiac was created in a laboratory on Earth two years later. In the Silver Age: JLA one-shot, the Injustice League discovered numerous shrunken alien cities found in Brainiac's abandoned spaceship. Brainiac battles Superman during the Infinite Crisis event. Cover of Superman (vol. 2) #219 (September 2005). Art by Ed Benes. Brainiac later reappeared as a swarm of interlinked nanotechnological units. Its operation was to sabotage a Waynetech research facility accomplished by infecting Metallo with a computer virus and controlling him from orbit. Superman and Batman tracked Brainiac's signal to an orbital facility and attacked. Brainiac's nanoswarm body was destroyed, though he had infected the Metal Men during their previous encounter with Metallo. Brainiac proceeded to use them to acquire a prototype OMAC unit, which Bruce Wayne had developed through the use of Brainiac 13 nanotechnology. Superman and Batman destroyed the OMAC body with the aid of the Metal Men, after the Metal Men overcame Brainiac's control. Following revisions to Superman's continuity in Infinite Crisis and Action Comics #850, Brainiac reappeared in a self-titled five-part story arc in Action Comics. In Action Comics #866 (August 2008), a Brainiac robot probe (resembling his skeleton-esque Pre-Crisis incarnation, and mistaken for the real Brainiac by Clark) arrives on Earth and battles Superman. After the probe is defeated, information about Superman's blood is sent to the original Brainiac. As Brainiac wakes up, his computer announces "Attempt #242 in progress", a reference to Brainiac's first appearance in Action Comics #242, and to the many encounters between Brainiac and Superman. In the following issue, Supergirl reveals to Superman that Brainiac shrunk the Kryptonian city of Kandor and placed it in a bottle, and that all previous incarnations of Brainiac that Superman has encountered were just probes, clones, and nanite-controlled bodies. She notes that no one has ever actually seen Brainiac. Inspired by Supergirl's story, Superman attempts to find Brainiac and stop him. He heads to a world under attack by Brainiac just in time to be caught in a supernova as Brainiac destroys the system's star and the populated world along with. The supernova knocks Superman out, and he is caught and brought onto Brainiac's ship. Superman escapes from his imprisonment and sees Brainiac emerging from his "bio-shell". This version of Brainiac resembles a much larger and more muscular version of the original, Pre-Crisis Brainiac, and has motives similar to the Superman: The Animated Series incarnation of the character in that he travels the universe and steals the knowledge of various alien cultures, abducting and shrinking cities from each planet as samples, and then destroys the planet so that the value of the destroyed civilization's knowledge is increased. Superman attacks Brainiac, but Brainiac manages to overpower the Man of Steel before restraining him with the help of his ship's internal systems. Brainiac inserts the subdued Superman into a machine that allows him to read the Kryptonian's mind, with the intent of assimilating his brain. Brainiac's ship then travels to Earth and prepares to abduct the city of Metropolis. Brainiac successfully steals Metropolis, and prepares to fire a missile that will destroy the Sun and the Earth itself. Supergirl ends up captured along with the rest of Metropolis, but Superman breaks out of his restraints again and frees her. Supergirl stops the missile, while Superman battles Brainiac. Brainiac appears to have the advantage in physical combat yet again, but Superman knocks Brainiac out of his ship and into a swamp, where Brainiac is overwhelmed by the microscopic organisms covering his body. Superman uses this distraction to defeat Brainiac. While Superman frees the cities of Metropolis and Kandor, the villain launches a missile to the Kent farm in an act of spite. The farm is destroyed, and Jonathan Kent suffers a fatal heart attack because of it. Brainiac is brought to a top-secret military base, where the imprisoned Lex Luthor is assigned to discover his secrets. Luthor eventually manages to use Brainiac's connection to his ship to kill the soldiers assigned to watch him. Brainiac manages to free himself from Luthor's control, forcing him on board the ship, and the two make their escape. Notably, upon learning of Brainiac's modus operandi of destroying planets by destabilizing nearby stars when he is done collecting cities and knowledge from said planets, Superman openly speculates that Brainiac destroyed Krypton, which was destroyed when its sun went nova soon after Brainiac abducted Kandor and Argo. He also asks the alien what he did to Krypton's sun. Brainiac ignores the query, neither confirming or denying his responsibility, though he does heavily imply it ("In fifty-seven minutes, my solar aggressor will reach your sun. It will flare up, and the Earth will be incinerated. Just like Krypton."). Superman still believes Brainiac had a part in Krypton's destruction after the end of this story arc. Following this Brainiac, now in possession of his ship again, unleashes his robot army against the newly created planet of New Krypton, and the Kryptonian citizens rise up to fight the drones. General Zod's army proves totally unable to fend them off, as the Brainiac's ship's force fields are seemingly invulnerable and his drones are equipped with red sun ray guns, allowing them to kill tens of thousands of Kryptonians. Superman, being the only one who knows how to penetrate his force fields (having learned the trick in the previous story arc), manages to enter Brainiac's ship. Supergirl leads the Kryptonians against the drones, but is attacked by an anti-Kryptonian Brainiac probe. Superboy, Mon-El, and the Legion of Super-Heroes join the fight and save Supergirl. After this, Brainiac shrinks Kandor again and re-bottles it, including a miniature red sun to de-power all the Kryptonians inside. The Legion, Supergirl, Superboy, Zod, and Superman all make it on to Brainiac's ship, thanks to Brainiac 5 hacking his ancestor's force fields and allowing them entry. The Legion explains to Zod that, just as Krypton's city of Kandor is held in a bottle onboard Brainiac's ship, other planets' cities are also imprisoned, and, therefore, Zod cannot destroy Brainiac's ship until the cities can be rescued. Zod sends Supergirl off and then arrests the Legionnaires, branding them terrorists. Meanwhile, Superman is about to face off against Brainiac when he is knocked down by a kryptonite energy blast fired by Lex Luthor and subsequently captured. Brainiac locks him in captivity with the intent to experiment on him, but Superman escapes and meets up with the rest of the superheroes and Zod on a separate section of the ship. Zod enters the scene and engages Brainiac in combat while Supergirl, Superboy, and the Legion recover the bottled cities on Brainiac's ship, including Kandor. Zod seems to be losing his fight with Brainiac, when suddenly Superman gets up and tackles Brainiac from behind. Before the battle between the two Kryptonians and the villain can continue, Brainiac's ship starts to destabilize and descend towards the planet. It is revealed that Lex Luthor sabotaged the ship and re-sized one of the cities while inside. Luthor's intervention causes the ship to crash into New Krypton, destroying it while Supergirl and the Legion re-size Kandor. However the city that Luthor expanded is still growing, now putting Kandor at risk. As Brainiac 5 works on the problem, Supergirl is shocked to discover Superman impaled by pieces of Brainiac's ship as a result of the explosion. Superman appears to have been fatally stricken. Luthor, though reeling from the explosion, is pleased with all the destruction he has caused. Brainiac confronts Luthor in the ruins of the ship and is furious that Lex sabotaged his ship. Luthor mocks him and spits in his eye before Brainiac angrily snaps Luthor's neck, killing him. Now deprived of his ship and technology, and seemingly depowered by his ship's destruction, Brainiac finds himself faced by an entire city of angry, solar-powered Kryptonians. Zod is eager for a final showdown with Brainiac, who calls Zod a coward for confronting Brainiac with his powers intact and an army of super-powered Kryptonians at his back. In response, Zod fires the red sun radiation from an Archer rifle at himself, to remove his powers and thus supposedly level the playing field as he prepares to take Brainiac down. Brainiac 5 gives Superman a transfusion of Conner's blood and exposes him to a very large dose of concentrated synthesized yellow sun rays. Using these techniques, Brainiac 5 is able to revive Superman. Despite the loss of his powers, Zod is able to get the upper hand on the similarly-powerless Brainiac and force him to his knees. Zod is about to shoot Brainiac when Superman intervenes. This causes a heated argument between Superman and Zod. Zod commands his soldiers to restrain Kal-El so Zod can proceed with the execution of Brainiac. Brainiac 5, sensing that this is his moment of destiny, steps in and teleports himself and Brainiac off of New Krypton. It is revealed that Lex used a Luthor robot, supplied by the Toyman, to accomplish his mission on New Krypton, and that Brainiac killed the robot instead. Lex is very much alive and discussing with General Lane how his objective, to bring chaos to New Krypton, was achieved. Lex has been working as an agent of General Lane all along. The disarray that Lex caused provides Lane with a window of opportunity as he prepares for the impending war with New Krypton. Lex receives a Presidential pardon for his efforts. The story ends with Zod rallying his people as he declares war on the planet Earth. The story concludes in the next miniseries, Superman: War of the Supermen. Mon-El plants the many bottled cities that Brainiac has captured over the years on various planets across the galaxy. These cities will one day become the United Planets by the 31st century, the same planets that will produce the members of the Legion of Super-Heroes. Brainiac 5 takes Brainiac to their homeworld of Colu where he hands him over to Vril Dox II, a.k.a. Brainiac 2. Vril Dox happily turns his "father" over to his people for his crimes. However Lyrl Dox, a.k.a. Brainiac 3, releases his "grandfather" with a weapon called Pulsar Stargrave. What then occurs is an all-out battle for Colu between all three present-day Brainiacs. Vril Dox even calls in Lobo for help. Brainac breaks out of his prison and, after causing much damage on Colu, escapes with Pulsar Stargrave in tow for parts unknown. Brainiac's origin in The New 52 is revealed in Superman #23.2. Vril Dox was acknowledged as the greatest scientist on his homeworld, Yod-Colu, given his advances in force field technology and miniaturization. He developed an artificial intelligence, C.O.M.P.U.T.O., allowing him to discover the fifth dimension. Dox discovered the fifth dimension was in a state of war, and a group of its inhabitants, the Multitude, had entered their dimension and destroyed over a hundred planets. Realizing Yod-Colu was next in the Multitude's path, Dox tried to find a way to save his planet, even performing experiments on his son. The magistrates of Yod-Colu sentenced Dox to exile, but Dox used C.O.M.P.U.T.O. to take control of Yod-Colu's computer networks. Copying the planet's database, Dox constructed an army of robot servants called Terminauts and miniaturized the city his wife and son lived on and bottled it in a force field, while the rest of Yod-Colu was destroyed by the Multitude. After the destruction of Yod-Colu, Dox constructed an army of starships and distributed his consciousness across a series of robots that would each travel the universe in order to preserve planets from the Multitude, becoming known as the Collector of Worlds. One of these robots attacked Krypton. Dox became fascinated by Jor-El, a Kryptonian scientist who actually saved his homeworld from the Multitude. Upon returning to Krypton, however, Brainiac discovered Krypton had been destroyed. Referred to at first as 'The Collector of Worlds', Brainiac is first seen as the mysterious informant that supplies Lex Luthor information of Superman and his alien nature. Clark is having a dream of Krypton's final moments in which an artificial intelligence that controls the planet wakes up robots in an attempt to preserve the Kryptonian culture. Later, while Clark conducts an interview in a robotic factory, the same harvester robots appear. John Corben (the soon-to-be supervillain Metallo) is suddenly possessed by the artificial intelligence. It demands Superman. The robots create havoc throughout Metropolis, but Superman soon realizes that they are really after him. Superman fights the possessed Corben with the help of John Henry Irons. Although they managed to defeat him, the alien sentience had already miniaturized and bottled the city of Metropolis and took it to his ship in space. Superman travels to the ship to find many alien bottled cities, Kandor included. The alien identifies himself as a being from the planet Colu where he was known as C.O.M.P.U.T.O and on Krypton he was called Brainiac 1.0. He claims that, without Superman and the ship that brought him to Earth, his Kryptonian collection is incomplete. The alien intelligence demands Superman make a choice: the intelligence will disable life support in both the Kandor and Metropolis bottles, and Superman must choose which city to save using indestructible Kryptonian armor found on the ship. Superman decides on neither and wears the armor (which changes instantly into the current Superman costume design). Brainiac sends Metallo to attack Superman, but due to Superman reasoning with him over his feelings for Lois Lane, he breaks free of Brainiac's control and joins Superman in his attack. Superman then uses his rocket from Krypton that had also been miniaturized with Metropolis to attack Brainiac's mind, which the rocket was able to do since its primary mission was to protect Kal-El. In doing so, Metropolis was returned to Earth and Superman took possession of Brainiac's ship and made it his new super citadel. Notably, the ship Clark was placed into as a child was described as having "Brainiac AI", leaving the identity of the Collector of Worlds in doubt. The Colony of the Collector of Worlds told Superman that its AI technology went by different names, beginning on Yod-Colu as C.O.M.P.U.T.O. On Noma, he was called Pneumenoid; on Bryak it was Mind2; on Krypton he was called Brainiac 1.0; and, finally on Earth, he is the Internet. After this defeat, Brainiac retreated to deeper parts of the cosmos, and eventually came across the planet Tolerance, the setting of a bounty hunting glimmernet game show called The Hunted. Striking a deal with Lady Styx, overlord of the Tenebrian Dominion, he bottles a portion of the Sh'diki Borough of Tolerance to add to his collection. He encounters Jediah Caul, a former member of the Green Lantern Corps, who combats and infects Brainiac's ship. Ultimately, Brainiac abandons his plans with the Sh'diki Borough and ejects Caul and the bottled city before leaving for parts unknown. Back on Earth, during an investigation of 20 kidnapped people who developed metahuman powers after being kidnapped by Brainiac, one of these 20 infects Lois Lane, thereby giving Brainiac control over a close ally of Superman. Brainiac plots his return to Earth, using Lane to infiltrate Earth's defense systems to allow an easier path for his physical return. and even upgrading her body to contain his 12th level intelligence. His minion Cyborg-Superman (a reconstructed Zor-El, father of Supergirl) constructs a portal to allow Brainiac's command ship and "daughter ships" to travel to Earth from throughout the galaxy. Superman, whom Brainiac had conspired to 'infect' with the monster Doomsday in order to drive him away from Earth, uses his augmented power to attack Brainiac's gigantic mothership and break through to its core and, finally, Vril Dox himself. The Coluan appears still-humanoid, and explains his reasoning for stealing minds from throughout the universe: he has concluded that if he can 'unite' the minds of a certain critical number of people, he will be able to change reality itself. His motivation for this appears a desire to right the wrongs he feels responsible for: the loss of his wife and child back on Colu. His plan is undone when Superman drags him, mothership and all, into a black hole. But then, Vril Dox is snatched away to safety, it seems, by a being who appears to be the true Brainiac: an immensely powerful entity from outside the universe itself. This version of Brainiac, a composite of Brainiac from around the Multiverse, is revealed to be the pre-Flashpoint era Brainiac who, having found his way into the Source Wall and into the Multiverse, was thrown back in the timestream and mutated by the effects of "crisis" events such as Crisis on Infinite Earths, Zero Hour, and 52, creating a godlike being. He then uncovered the location of Vanishing Point from nearly killing New 52 Earth-0's Michelle Carter, from which he could roam the complete history of the Multiverse, collecting doomed cities from defunct timelines, alternative futures, and parallel worlds to add to his collection, in Convergence, leaving behind an agent, Telos, to rule a planet of the same name containing the cities. Brainiac's attempt to do this to a future timeline of Earth-0 was narrowly averted by the heroes in the story The New 52: Futures End; Brainiac was contained in a T-sphere, leaving Telos stranded without his master, prompting the events of Convergence in which the planets are bid to fight each other. When the events of Convergence nearly end in an irreversible destruction of the Multiverse, the time traveller Waverider, formerly the pre-Flashpoint Booster Gold, frees Brainiac, who reveals he is sick from his mutations and only wishes to return to normal, to being Brainiac of Colu. He sends most of the heroes home, and with help from the Zero Hour Parallax and the pre-Flashpoint Superman, averts the collapse of the Multiverse from Crisis on Infinite Earths, and is returned to the normal Brainiac. His actions also allows various parallel universes and alternate timelines to exist as the new Multiverse. Brainiac's name is first referenced in an issue of Hal Jordan and the Green Lantern Corps. The entirety of the Green and Yellow Lanterns (including Hal Jordan, Guy Gardner, and John Stewart), along with Starro the Conqueror, are lured into a trap and subsequently hit with a shrink ray while on the planet Xudar, leaving them tiny and helpless. In the next issue, they are trapped in a bottle, and their jailer is revealed to be a robot claiming to run on "Brainiac 2.0" software. The robot heavily resembles both Brainiac's 1983 skeleton-esque incarnation and the robotic drones utilized by the post-2008 version of Brainiac. It has a collection of shrunken bottled planets, and travels in a ship resembling Brainiac's skullship. At the time it was not clear if this was the true Brainiac after Rebirth or yet another one of his drones. The machine's victory is short-lived, however, as it is revealed that Larfleeze was able to reprogram it to his side using an Orange Lantern ring, having rebooted its life systems after finding it inactive on his homeworld with its ship. Larfleeze is impressed that the machine was able to capture the Green Lanterns and Starro, and even more impressed with the machine's shrinking technology, and plans to hijack its technology to put together his own collection. He takes the ship and collection to his homeworld of Okaara. However, upon being informed that the Yellow and Green Lanterns are still fighting inside the bottle and trying to kill each other, Larfleeze's own greed for having everything gets the best of him and he ends up breaking the container. This frees the Lanterns, and somehow restores them to their normal size and strength, after which they immediately start rampaging inside the ship and trashing Brainiac/Larfleeze's collection. Hal, Kyle, John and Guy go on to lead the attack on the Orange Lantern Corps. With everyone fighting together, the Orange Lantern Corps are quickly overwhelmed. Larfleeze accuses the robot of playing him; when it responds that it simply did what he programmed it to do, Larfleeze destroys it in a rage. The Superman storyline "New World" later confirmed via a flashback cameo that the Post-Crisis, post-2008 version of Brainiac (the tall, muscular, green-skinned cybernetic alien scientist) still exists in the post-Rebirth continuity, and has encountered Superman in the past. Thus, the robot that defeated Starro, the Green Lantern Corps, and the Yellow Lantern Corps before subsequently being dispatched by Larfleeze was, in fact, one of his drones. Brainiac later arrived on Earth again and battled the Justice League, who proved no match for him and his ship, until Superman arrived. However, he did not come to destroy the Earth, but to deliver a warning: that there is a cosmic-level threat in the universe coming to Earth, one that the heroes of Earth are woefully ill-prepared for. Brainiac thinks he can defeat the threat, but it means teaming up with Superman and the Justice League and combining members of the League with some of the most dangerous supervillains in the DC Universe and sending them into battle against this extinction-level menace. Four teams outfitted with Brainiac's technology are formed (including among other members, Lex Luthor, Batman, Wonder Woman, and Sinestro), with Brainiac himself working directly alongside his nemesis, Superman. The No Justice miniseries begins with the Omega Titans, the aforementioned threat, attacking Colu, Brainiac's homeworld, which explains Brainiac's kidnapping of Earth's superheroes and supervillains. Brainiac claims to have developed a plan to defeat the Omega Titans and the superheroes only need to follow his orders to win, but Amanda Waller uses the hidden Protocol XI, which involves kidnapping the world's most dangerous psychics, to probe Brainiac's mind and find out what he knows. The strain of the psychic attack causes Brainiac's head to explode, apparently killing him. In Scott Snyder's Justice League run, in order to fill in the gap left by Black Manta and the Joker, Lex Luthor sets Professor Ivo to work reconstructing Brainiac, with the intention of him joining the Legion of Doom. Despite teaming up with them, Brainiac does have his own motivations, including planning his revenge against Waller. He is the gang version of Brainiac and first appears in Adventures of the Super Sons #1. Brainiac's most consistent power (endemic to all versions) is his "twelfth-level intellect", allowing calculation abilities, enhanced memory and advanced understanding of mechanical engineering, bio-engineering, physics, and other theoretical and applied sciences, as well as extensive knowledge of various alien technologies. For comparison, the population of 20th century Earth as a whole constitutes a sixth-level intelligence and the population of 31st century Earth as a whole is a ninth-level intelligence. His Post-Crisis incarnation claims that his brain can process and sort the knowledge of over four hundred ninety octodecillion beings (490 × 1057), which is a enormous number, about five billion times the estimated number of atoms of the Earth. The character has created devices such as a force field belt capable of withstanding Superman's most powerful blows, and a shrinking ray capable of reducing cities. All versions of him are also technopathic. Brainiac's advanced mental powers have shown him capable of possessing others, absorbing information from other beings, transferring his consciousness, creating and manipulating computer systems, replicating multiple versions of himself, and exerting powers to traverse or control space and time. Among organic beings, Brainiac views only his frequent partner Lex Luthor as a peer intellect. Brainiac is usually depicted with an incredibly high degree of superstrength and durability; the exact level varies, but usually hovers at around Superman's strength. Brainiac's exact abilities vary drastically throughout his various incarnations. Originally, Brainiac was a scientist with no superhuman abilities aside from his intellect. He fought Superman via the use of his advanced technology and cunning, similar to Lex Luthor. Among these were a forcefield belt which projected a shield that made him immune to all harm (even Superman's blows), a shrinking ray, and a headpiece consisting of a cluster of diode/electrode-like objects. His cybernetic headpiece let him interface with technology and project energy blasts from his head, which were powerful enough to significantly harm Superman. Superman described the blasts as "blindingly painful... almost unbearable" and as a threat to his life. The Pre-Crisis Brainiac was referred to by an omniscient narrator as "the super-computer space pirate-- Superman's most powerful nemesis." Brainiac being unpowered and reliant on external weaponry was largely still the case even when he was retconned as an android, but in the 1980s, this changed and he gained the abilities that would stick to all subsequent incarnations: superstrength and durability, technopathy, and super longevity. His technopathic abilities extend to control of his ship, with which he shares a symbiotic relationship. The android version of Brainiac was capable of downloading his consciousness to spare, robotic bodies in the event that his original was destroyed or damaged. He could also possess organic beings in certain circumstances, as he did to Luthor during Whatever Happened to the Man of Tomorrow?. The final body utilized by the Pre-Crisis Brainiac (resembling a robotic skeleton) was technopathic, had superstrength and durability, could discharge energy blasts capable of hurting Superman, and knew of how to "spin" the psychokinetic energies he generated into a web-like net which could hold Superman at bay. Among the knowledge he absorbed was extensive information on hand-to-hand combat techniques, making him a very skilled combatant. Despite this, he saw physical confrontation as beneath him, and preferred to defeat foes with his mind. John Byrne's re-imagining of the character possessed telepathy and telekinesis, as well as the ability to discharge energy blasts. He was an alien consciousness who had possessed the body of a powerful human psychic and awakened his powers, further augmenting them with an implanted electrode head-piece. His vast psychic powers allowed him to seriously challenge Superman, and defeat multiple members of the New Gods (including Orion) with a single psionic energy blast, but the body's lack of Superman-level durability was a major liability and eventually led to it being rendered useless in a gasoline explosion. After this organic body was destroyed, Brainiac's consciousness built and possessed various robotic bodies and occasionally hijacked other organic bodies (such as Doomsday's). His abilities were dependent on the body he was inhabiting at the time, which could vary from as weak as a normal human to far stronger than Superman. His nanoswarm incarnation, for instance, could shapeshift, regenerate, project energy blasts and force fields, and match Superman blow for blow; Superman stated Brainiac to have physical strength on par with Doomsday's in this form. His strongest incarnation was Brainiac 13, who, even prior to absorbing Imperiex, was so physically formidable that Superman could not remotely affect, much less damage, him. By contrast, Brainiac was easily able to kill Superman, and would have done so in a short time had he not been devoted to torturing the Man of Steel. It was later revealed that this version of Brainiac (like the previous ones) was merely a mentally-controlled probe of the real Brainiac, who was a living Coluan that had genetically and cybernetically enhanced himself. The true Brainiac lacked psychic powers, but still possessed super physical attributes, intelligence, and technopathy. He possesses a level of strength vastly surpassing that of a full-powered Superman; capable of easily overpowering the Kryptonian in a grapple and flooring him with a single punch, breaking his near-invulnerable skin by squeezing Superman's head with his fingers, and catching one of Superman's punches and crushing his hand until it bled, forcing Superman to his knees. His durability is also far greater than Superman's, shown when he absorbs several consecutive blows to the face from the Man of Steel without visible harm and later claims that Superman's punches did not hurt him at all. Even a concentrated and sustained burst of heat vision directly to Brainiac's eyes did not seriously debilitate him, though it inflicted noticeable damage. At one point Brainiac 5 warns that Superman would most likely die against Brainiac in a straight fight. Superman Secret Files and Origins 2009 further state that Brainiac is "as strong and invulnerable as a Kryptonian." Despite his enormous physical enhancements, Brainiac had several weaknesses. Like the Pre-Crisis Brainiac, he is mentally connected to his ship in such a way that he can be disabled for a short period if separated without warning. Initially, he had the weakness of being disabled by his mysophobia and sensory overload when dumped into Earth's atmosphere, though he does not seem to have this defect in his later battles on Earth, such as when he defeated Superboy, suggesting that he had fixed it, or that he is only overloaded in particularly dirty environments. Finally, being separated from his ship for prolonged periods causes him to physically deteriorate and become far less powerful, as Lex Luthor observed while studying his unconscious body over the course of several days when it was in the custody of the U.S. government. This Brainiac is an incredibly powerful physical fighter, but like his Pre-Crisis counterpart is most dangerous due to the advanced technology he wields, much of it of his own invention. These include his classic shrinking ray and force fields, as well as other gadgets such as missiles capable of causing stars to go supernova. His force fields are so impregnable that a direct hit from an energy weapon that kills several fully powered Kryptonians as collateral damage did not leave so much as a single scratch on his ship. Brainiac also possesses an army of at least tens of thousands of humanoid robotic "probes". These probes are strong enough to draw blood from Superman and tough enough to survive some of his powerful blows. During the New Krypton story arc, Brainiac upgraded his probes with red-sun ray guns for the purpose of fighting Kryptonians. When Brainiac orders these drones to attack New Krypton, they quickly kill over eleven thousand solar-powered Kryptonians. He is a biological creature that has altered his body to acquire more knowledge to become "better". With his ship, his vast knowledge, and his powerful technology, Brainiac has captured thousands of cities and has assimilated and destroyed just as many civilizations, making him the worst mass murderer in the history of the Milky Way and one of the most feared beings in the known universe. He is considered one of the most powerful villains Superman has ever faced. Brainiac, in The New 52, seems to have kept most of the powers and equipment of his Post-Crisis incarnation (including his shrinking ray, force fields, and robot army), with notable additions. Brainiac's ship has been massively upgraded in this incarnation; it is now larger than the entire Earth & Moon planet system, and carries within it a massive invasion fleet of many types of smaller ships. He still appears to possess the physical strength and near-invulnerability of his Post-Crisis counterpart, as shown when he easily defeats the Cyborg Superman. By the Superman: Doomed story arc, Brainiac has used his twelfth-level intellect to become an enormously powerful psychic and telepath, augmented by the minds that he has stolen and digitized from across the galaxy, and capable of taking control of all seven billion minds on Earth at the same time. He also demonstrates considerable reality warping abilities; he claims that the combined psionic power of all the minds he has captured throughout the universe can allow him to change reality to his will, and plans to use this power to remake the universe in his image. However, this plan is prematurely ended when Superman battles him telepathically and crashes his ship into a black hole. Following the Doomed story arc, it is further revealed that the Pre-Crisis Brainiac somehow escaped the Crisis on Infinite Earths itself, and mutated from the various crises since, becoming a godly being. This version of Brainiac is nigh-omnipotent and omniscient, with the ability to warp universes and time travel. Using this newfound power he either recreated or interacted with all the different iterations of himself throughout the multiverse, using his New 52 incarnation as yet another one of his many probes. He has grown so much in power that now he can collect cities from other universes at will. At the end of the Convergence story arc, Brainiac recreates the DC Multiverse. The character has been depicted in various out-of-continuity stories. In the Amalgam Comics line, which was a joint venture between DC and Marvel Comics, readers are introduced to Galactiac, a combination of Brainiac and Marvel Comics antagonist Galactus. Brainiac also appears in Superman: Red Son, JLA: Shogun of Steel, and the novel The Last Days of Krypton by author Kevin J. Anderson. In the Superman: Red Son graphic novel, Brainiac (here depicted as an alien AI) serves as the main antagonist. He first appears working with Luthor to undermine Superman, eventually shrinking and bottling the city of Stalingrad. Superman defeats Brainiac soon after, but his failure to restore Stalingrad becomes his one failure and a recurring source of guilt. After his defeat, Superman has Brainiac reprogrammed in order to serve him and the Earth, and help run Superman's Global Soviet Union, a task he takes to for the next four decades. While serving Superman, Brainiac repeatedly advises him to take more drastic courses of action to resolve his problems, such as suggesting he merely invade Luthor's United States, though Superman always rebuffs his most extreme suggestions. At the climax of the story, Superman eventually does decide to attack the United States, and Luthor deploys a futuristic U.S. Pacific Fleet and an army of superbeings (including Wonder Woman and Doomsday) in an attempt to stop him. They are either incapacitated by Superman or cut to shreds by Brainiac's ship, and Luthor himself is yanked down deep into the recesses of the Fortress by Brainiac to be converted surgically into a Superman robot. Brainiac and Superman storm the White House after defeating all the U.S.'s defenders. They are greeted by Lois Luthor with the last weapon, a small note written by President Lex Luthor that reads, "Why don't you just put the whole world in a bottle, Superman?". Superman, realizing the error of his ways, is horrified by the revelation that he has essentially become another Brainiac- "an alien bullying a less-developed species." He calls off the invasion, but Brainiac objects; he reveals that his twelfth-level intellect let him easily subvert any attempts at reprogramming him, and that he has never been under Superman's control. He attacks Superman with a kryptonite beam weapon, nearly killing him while boasting about how he will conquer the entire universe after finishing off all his foes on Earth. However, he is finally defeated when Luthor (having escaped surgery through undisclosed means) hacks and shuts off Brainiac from the inside. His body is promptly destroyed by Superman. In one last act of spite, Brainiac's death automatically triggers his ship's self-destruct, which, according to Luthor, would eradicate the entire Earth and everything within a 15,000,000 mile radius. As the gravitational singularities powering Brainiac's ship threaten to explode, Superman rockets it into outer space, where it blows up. The Earth is saved, but Superman is thought to have been caught in an explosion and killed. In the epilogue at Lex Luthor's funeral a thousand years in the future, it is revealed that unbeknownst to the rest of the Earth, Superman survived the destruction of Brainiac's ship. He walks quietly away from the ceremony, planning to live among humans rather than ruling over them. In the JLA: Earth 2 one-shot, the Justice League are drawn to the anti-matter universe to defeat the Crime Syndicate of America, their villainous anti-matter counterparts, with Brainiac apparently acting as the robotic servant of Ultraman. However, after the Syndicate travel to the League's universe, it is revealed that the true mastermind of the scheme was Brainiac, who is revealed to be an organic life form trapped in a tank acting as Ultraman's servant, having manipulated both teams into a position where they will be trapped in each other's worlds and thus unable to win, as the nature of each world means that 'good' and 'evil' will always win in each world. However, Brainiac is defeated when the League deliberately walks away so that the Syndicate can return in time to stop him. In Batman: The Dark Knight Strikes Again, set in a world where heroes have been publicly 'retired' for years as Lex Luthor took over and blackmailed assorted heroes into acting as his discreet 'servants', Brainiac is working with Luthor to keep the city of Kandor contained, the two destroying one Kryptonian family each time Superman defies them. He is eventually destroyed by Lara, the daughter of Superman and Wonder Woman, who claims to be surrendering to him only to allow the Atom to break the bottle from inside and allow the Kryptonians within to access their powers, decimating Brainiac with their heat vision. Bizarro #1 created this doppelganger of Brainiac to live on Bizarro World. Since Brainiac shrunk the city of Kandor, his Bizarro counterpart felt compelled to do the opposite, and expanded a city in Antarctica, creating Big City. In the alternate timeline of the Flashpoint event, Brainiac is the ruler of 31st century Earth, and has captured Kid Flash, whom he then placed in stasis, but Hot Pursuit managed to rescue the young speedster. Escaping from Brainiac's base, Kid Flash and Hot Pursuit formulate a plan to return to the 21st century. Kid Flash then allows himself to be recaptured by Brainiac and put into stasis. Kid Flash uses his super-speed in the virtual reality access port to shut down the security program and Hot Pursuit then blasts Brainiac from behind. While they used his orb energy to return to the past, Brainiac impaled Hot Pursuit and attacked Kid Flash. Hot Pursuit breaks the orb energy projector to allow Kid Flash's super-speed to return. Kid Flash then returns to the 21st century, promising to rescue Hot Pursuit from Brainiac. Brainiac is one of the villains in the Justice League/Power Rangers crossover, when the Power Rangers and Lord Zedd accidentally travel to the DC Universe through a teleportation accident, with the Rangers arriving in Gotham City, while Zedd finds himself in one of the trapped cities on Brainiac's ship. Escaping from the bottle, Zedd proposes an alliance with Brainiac in exchange for providing Brainiac with a city from his Earth, Zedd releasing a wave of monsters across the world to distract the Justice League. Using the distraction of Zedd's monsters, Brainiac dispatches his drones to take control of the Rangers' zords, stealing their powers and fleeing back to their world, forcing the Rangers and the Justice League to 'borrow' the Hadron Collider to create a temporary dimensional transporter that will allow them all to get back to the Rangers' world. Back in the Rangers' world, Brainiac nearly takes control of Cyborg, but Billy Cranston is able to regain his powers in time to take Cyborg down so that Batman can reboot him. Brainiac has captured Alpha 5, officially to question him as the only other example of independent artificial sentience he has ever met, but Alpha, although speculating that Brainiac abducted him because the villain is lonely, rejects the idea that the two are similar, arguing that Brainiac's actions show a selfishness and an inability to grow where true sentience relies on making oneself open to working with others. After regaining their powers, the Rangers are able to rescue Alpha and force Brainiac into retreat. In the Adventures of Supergirl comic, which takes place in the universe of the Supergirl TV series, a very different version of Vril Dox appears as a recurring villain. In this series he is a greedy, green-skinned alien hacker from the planet Yod who was hired by an as-yet unknown individual to frame Supergirl's ally Winn Schott for funding and aiding terrorism. When Supergirl accesses Winn's computer, he presents himself falsely as an A.I. system called V.R.I.L., and pretends to be a creation of Schott's. He figures out Supergirl's real identity and plans to expose her, then he electrocutes her ally James Olsen from through Winn's computer. Eventually, Vril is tracked down by Supergirl with the aid of Winn and an expert hacker he knew, and Supergirl easily defeated him, after which he was arrested. James Marsters primarily played Brainac in Smallville, while additional portrayals have also been done by John Schneider (Jonathan Kent in season five), John Glover (Lionel Luthor in season seven), Laura Vandervoort (Kara Zor-El in season seven) and Allison Mack (Chloe Sullivan in season eight). Acting as a central antagonist for seasons five and seven and a supporting villain for season eight, Brainiac is mostly referred to by his assumed name, but Jor-El refers to him as the Brain InterActive Construct. 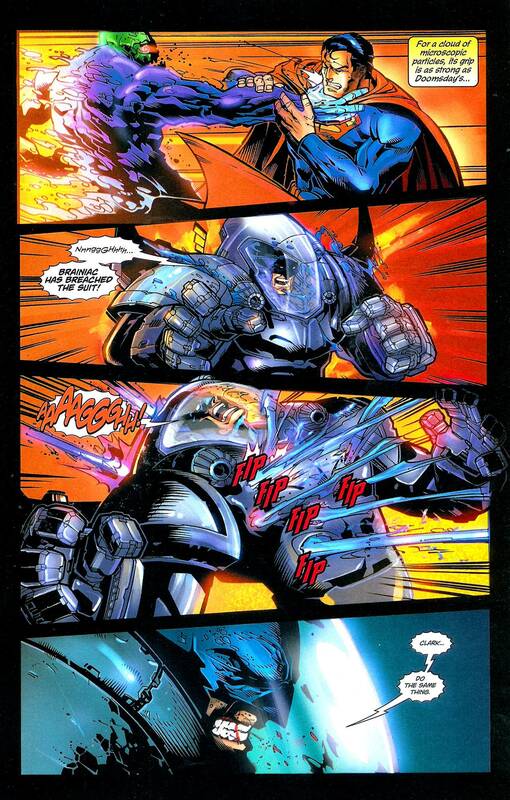 The Smallville interpretation is similar to the DC animated universe version; a self-aware computer in humanoid form with a Kryptonian origin who had a part in the planet's destruction (having destabilized Krypton's core alongside Zod) but is portrayed as a shape-shifting AI created by Dax-Ur (who abandoned the project) and completed by Jor-El but corrupted by Zod. Introduced in season five, he first appears under the "Milton Moses Fine" name, posing as a professor at (fictional) Central Kansas A&M University and presenting himself as a Kryptonian ally to trick Clark Kent into releasing Zod. But after Clark learns the truth, Brainiac fights off with his own Kryptonian-esque powers and then manipulates Lex Luthor into creating a 'vaccine' that will make Luthor's body suitable to act as Zod's new host after temporarily shutting down all of Earth's electronics with a virus. Although apparently destroyed, Brainiac is restored in season seven. The weakened humanoid manipulated Clark into helping regain his full power by locating Dax-Ur, to which he killed by downloading his creator's memories before convincing Luthor that Clark is a threat by impersonating Kara Zor-El and revealing Clark's secret identity to Luthor, but is defeated in battle by Clark and seemingly killed. However, Brainiac returns in season eight, possessing Chloe Sullivan to use as a means of unleashing Doomsday on Earth. The Legion of Super-Heroes assist Clark in extracting Brainiac from Chloe and taking him to the future, but are too late to stop him from releasing Doomsday. A reprogrammed version of Brainiac returns in season ten from the future, offering Clark advice on his future growth as a superhero. In Supergirl, there is a villainess called Indigo, who comes from the planet Colu, debuting in episode "Solitude". 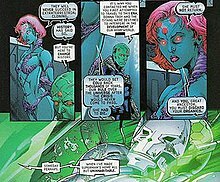 While the original Brainiac does not appear in the series, his name is mentioned, as stated that she is "a member of the Brainiac clan" implying a possible existence of Superman's enemy in the show. Also, another Coluan named Brainiac 5 is a member of a superhero team from the 31st century called the Legion of Super-Heroes. In the episode, "Battles Lost and Won", Brainiac 5 reveals that, in preventing the Blight from spreading its virus in the future, it has restored the original Brainiac in the future, who now seeks to destroy all AIs, forcing Brainiac 5 to remain in the 21st Century while Mon-El and Winn Schott return to the future to battle Brainiac. Brainiac appears as the main antagonist of the first season of Krypton, portrayed by Blake Ritson. Brainiac, known by the Kryptonians as the "Collector of Worlds", finds Krypton and seeks to destroy it. The character, sporting a look similar to his post-2008 incarnation, was created via a combination of extensive makeup/prosthetics (which took four to seven hours to apply) and CGI. Brainiac made his first television appearance in the episodes of the Filmation animated series The New Adventures of Superman, voiced by Cliff Owens. In this series, Brainiac was from the planet Mega whose entire population had perished in a series of atomic wars with the exception of one survivor, Professor Hecla. Hecla created Brainiac and sent him to Earth to use his shrinking ray to create a sort of "cosmic Noah's Ark", by shrinking a male and female of each Earth species to take back to repopulate Mega. Brainiac appeared in several episodes of this series, which began in 1966. Brainiac would resurface as a member of the Legion of Doom in Challenge of the Super Friends cartoon voiced by Ted Cassidy. Brainiac also appeared in a Super Friends short episode "Superclones". He ended up making of clones of Aquaman and El Dorado. He was voiced by Stanley Ralph Ross, who took over for the late Cassidy in 1980. The mechanical version of Brainiac appeared in Super Friends: The Legendary Super Powers Show in the episodes "The Wrath of Brainiac" and "The Village of Lost Souls" again voiced by Stanley Ralph Ross. In "The Wrath of Brainiac", Brainiac reveals that he shed his earlier appearance when he worked alongside Darkseid. Brainiac next appeared in The Super Powers Team: Galactic Guardians episode called "Brain Child", once again voiced by Stanley Ralph Ross. Brainiac appears in the DC Animated Universe, voiced primarily by Corey Burton. Brainiac as depicted in Superman: The Animated Series and Justice League. In Superman: The Animated Series, Brainiac is first depicted as the supercomputer that runs most of the day-to-day operations on the planet Krypton. He heeds Jor-El's warning about Krypton's imminent destruction. But rather than validate Jor-El's claims, he dismisses them as false while secretly working to save himself. As he contains Krypton's collective knowledge, Brainiac reasons that should he inform the government, they would put him to work to stop the inevitable and ultimately doom both parties. Brainiac survives Krypton's destruction after downloading his programming into a satellite and creating an android body for himself. He then travelled to other planets and assimilated their information before destroying them, claiming that the fewer beings who possess the knowledge, the more precious it becomes. In "Stolen Memories", Brainiac makes his way to Earth under the pretense of a peaceful exchange of knowledge with Lex Luthor. Superman, however, discovers Brainiac's true intentions to betray Luthor and destroy Earth, and eventually seemingly kills Brainiac by destroying his ship. In "Ghost in the Machine", it is revealed that Brainiac downloaded his programming into LexCorp's computers during his last encounter with Superman. He then forces Luthor to build him a new android body. When Superman arrives to save Luthor, Brainiac is ultimately defeated when the Man of Steel magnetises his body so that the attracted metal would overwhelm him. In "Knight Time", Brainiac used nanites to control Bruce Wayne, having Bruce use Wayne Enterprises' technology to construct a ship that can leave Earth. However, Brainiac's plan was once again foiled after Superman destroyed both Brainiac and his ship. In "New Kids in Town", a futuristic era version of Brainiac traveled back to the past from the year 2979 to kill a teenage version of Clark Kent before the youth's future. But due to the efforts of Cosmic Boy, Chameleon Boy and Saturn Girl, Clark defeated Brainiac and teleported him into the Sun, incinerating the supercomputer. Brainiac returns in the Justice League animated series. In the episode "Twilight", he and Darkseid harass Superman. He first appears attacking after Apokolips had suffered a major defeat by New Genesis, prompting Darkseid to head to ask the Justice League for help. The story was a ruse, however, one intended to lure the League, Superman in particular, to Brainiac's headquarters. Brainiac's full plan was to extract Superman's DNA so that he could create a mighty organic body for himself, however, Darkseid betrayed Brainiac. During the subsequent battle, Batman's attempts lead to both the artificial intelligence and the Lord of Apokolips being destroyed. Brainiac also appears in Static Shock. In the crossover episode "A League of Their Own", Brainiac is reduced to a single circuit board kept in stasis but escaped confinement following a power failure at the Justice League's Watchtower. Static and Gear had been recruited by the League to help recharge the Watchtower's generators. During that time, Brainiac slowly began gaining control of the Watchtower. He sent the League a fake distress call to lure them away, then attempted to dispose of Static and Gear before turning the Watchtower into his new body. The two teen superheroes discovered his plan and alerted the League to return. Brainiac had managed to download his mind into Gear's Backpack, taking control of Richie Foley (voiced by Jason Marsden) to once more recreate his body and his mission. Static and the Justice League were able to fry Brainiac's hardware temporarily, allowing Richie to be freed and for Brainiac's base to self-destruct. Brainiac's voice here sounds quite different; the producers of Static Shock decided to pitch Corey Burton's voice significantly lower for their show. Brainiac combined with Lex Luthor as seen in Justice League Unlimited. Brainiac also appears in Justice League Unlimited. The android is briefly seen in the animated adaptation of "For The Man Who Has Everything" as a household robot (voiced by Mike Farrell). The season one finale revealed a major plot twist where a nanotech piece of Brainiac had been integrated with Lex Luthor, subtly influencing Luthor's decisions, curing his host's kryptonite cancer and giving him superhuman strength. He intended to put his mind into Luthor's duplicate of A.M.A.Z.O. made from Cadmus nanotechnology, revealing himself only after being thwarted by Amanda Waller and the seven founding Justice League members. Brainiac tries to digitize the League, but the Martian Manhunter escapes and stops this. As the two escape, Brainiac's goal to record all knowledge in the universe and destroy all of creation is undermined by Luthor, pointing out his lack of imagination. Lex offers to show him a purpose beyond the mere fulfillment of his programming, to remake the universe to their preferences. Using alien nanotechnology, Brainiac turns into an exosuit that merges with Luthor; the fused character's appearance (also voiced by Clancy Brown) is inspired by the Silver Age Brainiac. He also creates duplicates modeled after the Justice Lords to distract the League. Though he defeats the League, the two are taken down when the Flash then taps into the Speed Force and purges Brainiac from Luthor's body, leaving nothing left. However, the final season reveals Brainiac's consciousness survives and is able to communicate with Luthor as a sort of multiple personality disorder; it is never made clear if the hallucination is actually Brainiac or merely a figment of Lex's imagination. Obsessed with regaining their lost "godhood", Luthor joins the Secret Society in order to obtain a piece of Brainiac in Gorilla Grodd's possession, subsequently usurping Grodd's place as the Secret Society's leader, and even sacrifices various Secret Society supervillains during an internal showdown, all to bring Brainiac's fragment back online. Returning to the task of resurrecting Brainiac, Luthor hooks Tala up to a machine to gather Brainiac's essence from the remains of Brainiac's ship with Darkseid, killing Tala in the process, but ends up reviving Darkseid fused with Brainiac technology, and Brainiac's presence is removed from Luthor's mind. Brainiac 1.0 appears in the second season of Legion of Super Heroes, voiced again by Corey Burton. Brainiac 5 is a descendant of him who is an unwanted robot on his home planet. In the second-season episode "Message in a Bottle", Brainiac 5 reveals the past atrocities caused by his predecessor, one such atrocity being the shrinking and abduction of the Kryptonian city of Kandor; in this version Kandor was also the location of a device that kept Krypton's planet core stable, and thus by abducting the city, Brainiac ensured the demise of Krypton. In the two part finale of the series "Dark Victory", Brainiac 1.0's programming takes control of Brainiac 5. He turns against his team, kills Imperiex enough to deprive Superman's clone Kell-El of his revenge, and has a grand plan to bring order to the universe. To do this, he uses forbidden technology that transforms matter, living beings, and entire worlds into digital information to be stored inside himself. With help from Superman and Kell-El merged inside his mind, he is ultimately destroyed by Brainiac 5, but in the end he survives and starts rebuilding himself as Brainiac 6. While the Legion of Super-Heroes television series does not share the same continuity as the DC Animated Universe, this version of Brainiac is also voiced by Corey Burton and shares the same musical leitmotif from his DCAU appearances. Brainiac is featured in Batman: The Brave and the Bold, voiced by Richard McGonagle. Brainiac's earliest outfit (albeit with slight modification) as a Coluan is seen in the episode "The Siege of Starro!" Pt. 2 as a trophy in the spaceship of the Faceless Hunter (the minion/herald of Starro). In "Battle of the Superheroes! ", Brainiac shows up at the end of the episode, following Lex Luthor's defeat, plotting to shrink Metropolis in order to repopulate his destroyed planet, causing Batman and Superman to spring into action. Brainiac makes a cameo appearance in the Teen Titans Go! animated series. In the episode "Laundry Day", Cyborg heads to his room to get a new body while the current one is in the wash; Brainiac's body is one of the choices, but Cyborg dismisses it, saying that it is "too brainy". In The Looney Tunes Show episode SuperRabbit, Marvin the Martian portrays Brainiac. Brainiac appears in Justice League Action, voiced by John de Lancie. He is mostly similar to the early Silver Age version of the character, being an alien scientist who shrinks and bottles cities for his collection; he also wears an outfit similar to his post-2008 counterpart, though he lacks other aspects of that version such as stoicism and superhuman strength/durability. Unique to JLA, this version is shown to have a wider top part of his head. In "Plastic Man Saves The World", Brainiac attempted to take Metropolis to add to his collection, adapting his drones to the Justice League's attacks. However, he failed to consider Plastic Man being able to sneak aboard his ship multiple times and destroy his ship before it could fire its shrinking ray. After the ray was destroyed, Brainiac updated his data banks to make Plastic Man a higher-level threat to him and swore vengeance. In "Battle for the Bottled City", Brainiac returned in a hover tank, roving around the Fortress of Solitude to regain the bottle city of Kandor. As Superman traveled inside the bottle city, Atom and Cyborg were left to protect the Fortress, which Brainiac easily infiltrates. He incapacitated Cyborg, destroyed several Superman robots, and seemingly kills the Atom, but Atom revealed that he merely shrank and commandeered one of the remaining Superman robots, using it to pick up and toss Brainiac's tank. Though Brainiac defeated the Atom, their battle uncorked the bottle of Kandor, allowing Superman (still small-sized) to beat up Brainiac and defeat him once again. During the early development of Superman III, Ilya Salkind wrote a script in that Brainiac was featured as the main antagonist. However, when Leslie Newman and David Newman rewrote the script, Brainiac was cut from the film. Late actor Richard Pryor was considered for the role. In 2007, film director Bryan Singer reported that he wanted to use Brainiac, along with Bizarro, as an antagonist in the cancelled Superman: The Man of Steel, the planned sequel to Superman Returns. However, the project was finally scrapped by Warner Bros.
Brainiac has been suggested as "definitely down the road" as a villain in the DC Extended Universe and future Man of Steel sequels by director Zack Snyder. There are tons of nods to Brainiac in Man of Steel such as the skull shape of the codex, the tentacles attached to the World Engine, and General Zod experiencing sensory overloads when exposed to Earth's atmosphere, similar to Brainiac's weakness. Brainiac appears as the titular antagonist in the 2006 direct-to-video animated feature Superman: Brainiac Attacks voiced by Lance Henriksen. The movie begins with Brainiac landing on Earth in a meteor. Brainiac goes around absorbing information until Superman destroys him with his Arctic-breath. However, Lex Luthor is able to save a piece of Brainiac and forms an alliance with the Kryptonian robot. Luthor gives Brainiac a new body, made from his satellite weapon. Brainiac is also equipped with a kryptonite beam and the ability to track Superman by his Kryptonian DNA. Luthor and Brainiac's bargain revolves around Brainiac using his new body to destroy Superman, and afterwards, Brainiac would allow himself to be "defeated" by Luthor and leave for another planet so that Luthor would appear as a hero. However, Brainiac betrayed Luthor after he believed Superman was destroyed, but in the end, Superman returned to defeat Brainiac after a lengthy battle. This time, Superman made sure that this copy of Brainiac was completely destroyed. Brainiac appears as the main antatonist in the animated film Superman: Unbound, based on the story arc Superman: Brainiac by Geoff Johns and Gary Frank. Brainiac is voiced by John Noble. Brainiac makes a cameo appearance in the animated film Lego Batman: The Movie - DC Super Heroes Unite, an adaptation of the video game of the same name, with Troy Baker reprising his role. Brainiac appears in Lego DC Comics Super Heroes: Justice League: Cosmic Clash, voiced by Phil LaMarr. This version miniaturizes, bottles and collects entire planets, rather than cities. He plans to do so to Earth in order to complete his collection. He uses a weapon to scatter Superman, Wonder Woman and Green Lantern throughout time to support his plans. Although Batman and Flash succeed in sending their fellow Justice Leaguers to the present and Cyborg and Supergirl manage to slow down Brainiac's forces, Brainiac succeeds in shrinking and bottling Earth. However, the League use a massive mech to release Earth and restore it to its normal size. Feeling he has no purpose, Brainiac sets himself to self-destruct. Due to the large blast radius, Batman convinces Brainiac to collect coins to avoid Brainiac from detonating. Brainiac is then arrested and put in prison. Brainiac appears as the final villain in DC Super Hero Girls: Intergalactic Games, voiced by Fred Tatasciore. He appears as the mastermind behind Lena Luthor. After she fails to kill the heroes, Brainiac leave her to drown and use the robots (including Platinum, one of the Metal Men) she used to build himself a giant body with all weapons needed to counter the superheroes' powers. His robotic body is destroyed with the combined efforts of the heroes through Platinum, who sacrifices herself to destroy him. However at the end, he is still alive and takes off to places unknown. Brainiac served as the final boss in the Superman arcade game published by Taito Corporation in 1988. Brainiac was the final boss in the 1992 Sunsoft game Superman. In Superman 64, Brainiac from the DCAU appears not only as a level boss, but also as a playable character in multiplayer. However, when the player faces Brainiac in the game's final level, Brainiac simply stands in place unless the player attempts to use heat vision on him. Superman was forced to stop Brainiac and save the world after Brainiac kidnapped Lois Lane in the Sega Master System and Sega Genesis video game Superman: Man of Steel. In the Xbox video game Superman: Man of Steel, Brainiac 13 is the game's final boss. Players must compete against B13 drones throughout the game, before facing the android on the final level. Brainiac was featured in the concept art in the console versions and as a main boss in the Nintendo DS version of Superman Returns, looking vastly different from other incarnations. Brainiac is a featured in the video game Justice League Heroes voiced by Peter Jessop. In the game, Brainiac first invaded S.T.A.R. Labs and ordered a huge legion of robots to seal off the area. Batman and Superman head for S.T.A.R. Labs, destroy Brainiac's robots, and battle Brainiac. Later the League infiltrates his underground fortress on earth and engages Brainiac in combat. Brainiac, defeated, is later resurrected/possessed by the villain Darkseid. Corey Burton reprises his role as Brainiac in DC Universe Online. Here, Brainiac returns to Earth and both superheroes and other supervillains of the DC universe appeal to a truce to combat Brainiac. He is also (indirectly) the source of the player characters' powers, as a future version of Lex Luthor used his technology to create "exobytes", highly advanced nanorobots with the ability to infuse an organic host with superpowers. Brainiac also appears to be able to create Avatars and Sub-Avatars from the digitized information on superhuman powers, enormous robots that use technological, meta- or magical abilities. In the video game Scribblenauts Unmasked: A DC Comics Adventure, Brainiac is the secret leader of the supervillains and the main antagonist. With the help of the Scribblenauts' Doppelgänger, he wants to use the Starites and Lily's globe to summon and merge with the other 51 Brainiacs and become a "perfect" being. He unites with other DC Comics villains to obtain the Starites, each failing to do so. When the Justice League arrives, he hacks Cyborg and uses Lex Luthor, the Joker, Harley Quinn, the Cheetah, Professor Zoom, the Ocean Master and the Sinestro Corps to fight their respective nemeses, again, each failing. When the Justice League reach Brainiac, he steals Lily's globe, adds the last Starite, teleports the Justice League away and puts his plan into action. After betraying Doppelganger, Brainiac and his clones begin to merge. Maxwell manages to summon alternate versions of the Justice League to defeat him and retrieve the globe. Brainiac makes a cameo appearance in the IOS/Android versions of Injustice: Gods Among Us as a support card. Brainiac appears as the central antagonist and a playable character in Injustice 2, voiced by Jeffrey Combs. This version of Brainiac has destroyed billions of populated worlds, including Krypton-a departure from most versions, where he merely collects Kandor and moves on, leaving the planet to die a natural death. Before destroying Krypton, he manages to add both Kandor and Argo City to his collection (as revealed in Supergirl's ending). Alerted to Earth and the existence of Superman, whom he believes is the last Kryptonian, after Superman's Regime kills many members of the Green Lantern Corps, Brainiac arrives on Earth to collect its cities, putting him in conflict with both the Regime and Batman's Insurgency. He conspires with Gorilla Grodd and the Society, who assist Brainiac in his invasion, though once it becomes apparent that Brainiac plans to destroy Earth the Society disbands. Gorilla Grodd continues to serve Brainiac, plotting to overthrow and kill Brainiac and take control of his ship, but is killed by Aquaman and Black Adam during the invasion of Kahndaq before he can do so. He is surprised to learn that Kara Zor-El survived the attack on Krypton alongside her cousin—her ship was knocked off course and she was put into suspended animation, to later be found by Black Adam and taken in by the surviving remnants of the Regime—and seeks to add her to his collection as well. The superheroes and supervillains of the Insurgency and Regime are all forced to band together in order to have a chance at stopping him. After Superman defeats Batman and the Insurgency and restores the Regime's rule over Earth, he kills Brainiac, and frees all of the warriors trapped in Brainiac's collection, giving him an army of billions of Kryptonian, Daxamite, and Czarnian soldiers to use to maintain his control over Earth. Superman also bonds with Brainiac's ship, and uses its technology to turn Batman into a mindless slave. Superman then confronts an imprisoned Supergirl, and, to her horror, threatens to do the same thing to her if she does not join the Regime. In Brainiac's own ending, the version that defeated Brainiac will turn out to be his descendant. The other characters' endings will either have Brainiac killed or handed over to the authorities. The Injustice version of Brainiac is mostly based on the post-2008 version of the character, being a genetically and cybernetically enhanced Coluan scientist with a twelfth-level intellect, his signature skull ship, an army of robotic probes, a fleet of mentally-controlled smaller ships, and the strength/durability to physically match Superman. In addition to Brainiac 5, Brainiac 6 is referenced in his pre-battle dialogue if Brainiac fights Brainiac, with one of them revealing he is the other's descendant and the other challenging him to prove his worth as an heir. Brainiac makes an appearance in Lego Batman 2: DC Super Heroes, voiced by Troy Baker. He is seen briefly in the final scene of the main story watching Earth from an orbiting spaceship, and after witnessing Green Lantern shoot a green beam summoning others to the planet, Brainiac mutters "I have located it." Brainiac is also a boss fight and unlockable character, found in Gotham Park. Brainiac appears in Lego Batman 3: Beyond Gotham as the main antagonist, now voiced by Dee Bradley Baker. He summons representatives of all known Lantern Corps (such as Sinestro, Atrocitus, Star Sapphire, and Hal Jordan) in order to claim their energies, which will power a crystal that will shrink Earth. According to him, he has lost his appetite for simple cities and plans to claim entire worlds. The Justice League and the Legion of Doom defeat him on his ship, but the villain escapes as his ship crashes in Gotham. Brainiac returns once Earth is returned to normal size, mind-controlling a giant-sized Superman, but is eventually defeated and shrunk himself, placed next to Lex Luthor and the Joker in Arkham Asylum. However, Luthor inadvertently breaks the bottle holding him, freeing him once again, after which Brainiac, as shown with a clenched fist, prepares to vengefully attack them. Dee Bradley Baker reprises his role for a brief cameo in Lego Dimensions. Brainiac is summoned to Middle-Earth by the Riddler to battle the heroes with mind-controlled Orcs. Brainiac appears as a playable character in Lego DC Super-Villains, with Corey Burton reprising his role from the DC Animated Universe. When Gorilla Grodd, Killer Frost, Scarecrow, and the Rookie travel to Smallville, they look for something to get into space suggesting Brainiac's ship. Brainiac's unlocked by collecting his token in the final level, "Darkseid of the Moon." Brainiac appears in the second episode of Justice League: Gods and Monsters Chronicles (a companion to Justice League: Gods and Monsters), voiced by Tara Strong. This version is depicted as a contingency plan set by Doctor Sivana to take down Superman. Brainiac is shown to have lost control over his immeasurable psychic powers, creating an energy dome around himself in Metropolis. The effects are shown to take down attack helicopters and send cars flying. As stated by his creator, only a small nuclear warhead could stop him, or Superman. Superman shows up and penetrates the dome, seeing Brainiac for who he is: a crying, blue-skinned child with three diodes on his head, missing his left arm. Despite his attempts to reason with him and talk Brainiac into controlling his powers, Superman reluctantly kills Brainiac with his heat vision to put him out of his misery, much to his regret. Brainiac appears in The Last Days of Krypton, a novel by Kevin J. Anderson. This version of Brainiac is known as the Brain InterActive Construct, later renamed Brainiac by Commissioner Zod. Brainiac had admired the beauty and architecture of Kandor, and wanted to preserve the city from destruction should disaster strike Krypton as it did on his home planet of Colu. Zod permitted Brainiac's taking of Kandor, stating that Brainiac could have the city, as the rest of Krypton belonged to him. Brainiac's ship fired three lasers that pummeled the surrounding crust around Kandor and literally upheaved the city from Krypton's surface. A force field was then erected around the city which contracted, shrinking the city and its inhabitants. Brainiac departed without causing further destruction or seizing other Kryptonian cities. Brainiac (referred to again as "The Collector of Worlds") is introduced in issue #20 of the Young Justice comic series, based off the show. ^ "Brainiac". The Word Detective. July 31, 2007. ^ "Top 100 Comic Book Villains". IGN. ^ Engblom, Mark (April 28, 2009). "Which Came First? Brainiac or BRAINIAC?". Comic Coverage. Retrieved August 20, 2009. ^ Greenberger, Robert (2008). "Brainiac". In Dougall, Alastair (ed.). The DC Comics Encyclopedia. London: Dorling Kindersley. p. 61. ISBN 0-7566-4119-5. ^ Superman the Man of Steel #117 (October 2001). ^ Action Comics #782 (October 2001). ^ a b Action Comics #868 (October 2008). ^ Hal Jordan and the Green Lantern Corps #8-9 (2016). ^ Hal Jordan and the Green Lantern Corps #10-12 (2016). ^ Scott Snyder Joins Forces With James Tynion IV and Joshua Williamson. ^ Cardona, Ian (August 8, 2018). "Adventures of the Super Sons Introduces the Li'l Legion of Doom". CBR. Retrieved April 9, 2019. ^ Superman/Batman #36 (August 2007). ^ Superman: Last Stand Of New Krypton #3 (April 2010). ^ Adventure Comics (vol. 2) #6 (March 2010). ^ Supergirl (vol. 6) #24 (December 2013). ^ (27 May 2015). "Decoding Convergence With Jeff King: The Finale". ComicBook.com. Retrieved 29 May 2015. ^ a b Anderson, Kevin J. (October 2007). The Last Days of Krypton. Harper Entertainment. ISBN 978-0-06-134074-1. ^ Here's your first look at Superman villain Brainiac on the Syfy prequel series 'Krypton'. USA News. ^ "Brainiac". Jl.toonzone.net. Retrieved 2014-06-29. ^ John de Lancie [@johndelancie] (4 October 2016). "@DaChangeling Yes that is true" (Tweet) – via Twitter. ^ "s3_original_idea.pdf" (PDF). Retrieved 2012-05-05. ^ "Comic Book Legends Revealed: Richard Pryor as Brainiac?!". CBR. 9 September 2016. Retrieved 2016-09-24. ^ Hughes, David (2002). "The Death of Superman Lives". The Greatest Sci-Fi Films Never Made. Titan Books. pp. 176–179. ISBN 1-84023-428-8. ^ by Steve 'Frosty' Weintraub (2007-05-11). "Bryan Singer – Exclusive Video Interviews at the 2007 Saturn Awards". Collider. Retrieved 2016-09-24. ^ Jay Jayson (2016-03-25). "Metallo Was Originally Planned As Villain In Man Of Steel Sequel". Comicbook.com. Retrieved 2016-09-24. ^ "Castle's Molly Quinn Gets Animated as Supergirl". TV Guide. July 16, 2012. Retrieved July 20, 2012. ^ "NYCC: LEGO Heroes Return in "Justice League: Cosmic Clash"". Comicbookresources.com. October 11, 2015. Retrieved 2016-09-24. ^ Vazquez, Suriel (2017-01-17). "Injustice 2: Latest Trailer Reveals Brainiac, Robin, And Darkseid". Game Informer. Retrieved 2017-01-17.